While all plants need nutrients for growing and sustaining. Potted plants are no exception. The thing people need to understand is how and when to feed your plants, especially, when you practice container gardening. It becomes much more important for a gardener practicing container gardening to take care of their plant because, the plants have very limited resources to gather their requirements from. Plants in containers are have limited access to soil, water, nutrients, etc, and thus, the role of the gardener becomes much more important, as the gardener has to take care of all the plants requirements. Now the question arises - What should I feed my potted plants with? Chemical? Organic? or what? My take on this question, as I've been doing this (container gardening) for quite some time now, and also, since, I've studied soil science as a small part of the curriculum during my Graduation and also Post Graduation, is, that, we as container gardeners, should actually use organic fertilizers like vermicompost, manures, etc, as mostly these are enough to fulfill the plant's requirements, and contain most of the macro and micro nutrients that the plant may ever need. The basis of this belief are a few big problems associated with agricultural soils. We all know that almost all of the agriculture practiced in almost all parts of the world is heavily dependent on chemical fertilizers, and a large part of these chemical fertilizers are in the form of N-P-K [Nitrogen, Phosphorus and Potash (Potassium)] and D-A-P [DiAmmonium Phosphate], and since these make up a large composition of plant Macro nutrients these are the ones highly used the world over. While the NPK fertilizers are commonly called as Urea in India, the DAP's are commpnly known as Dye or Di. While all these nutrients are readily available to the plants from natural sources, due to excessive usage of the agricultural lands, these nutrients get depleted and hence are required to be replenished externally. Although being necessary for the plants, these nutrients are dangerously damaging to the plants as well as the soil and water involved in the agricultural practices using these fertilizers. These chemical or inorganic fertilizers with regular usage have the tendency to damage the soils beyond repair. Some problems associated with use of these fertilizers include Soil Acidification, where the chemical reactions of these fertilizers cause a fall in the pH level of the soils beyond a point where the soils become acidified and hence unusable for plants. Soil Salination is another problem which, to some extent can be attributable to the use of chemical fertilizers. For example, use of Potassium based fertilizers have a tendency to form a compound salt Sylvite [Potassium Chloride(KCl)], and we all know that saline soils are not very good for plants. Since our containers have limited soils, we have to take care of that only, and can't risk our plants dying due to acidification or salination. This is the reason, I use vermicompost to replenish my plant's nutrient requirements. Though, the organic manures are somewhat slower in showing results than their inorganic counterparts, they are particularly safer, and hence, I prefer these. Vermi compost have a good nutrient content and hence are pretty useful for our plants. The table above, shows that plants can get almost all the macro and micro nutrients needed for proper growth and survival from vermicompost. Moreover, since these are organically available, these are much more safer for the plants than the inorganic counterparts, and are available to the plants over a longer period of time, as the organic compost takes time to rot down and release the nutrients. Hence the plants won't grow very fast or big, but, would be healthy. There's one way, that I follow to feed my potted plants with compost which ensures that my plants get enough of the nutrients contained within the compost. What I do is, before using the compost, I let the soil dry a bit so that it doesn't become messy working with it when I'm mixing the compost with it. Once the soil has dried up to a workable form, I dig it up gently using a tool (I use long screwdrivers of different thickness as these are easy to work on with dense plant roots in small containers, and minimize the risk of the plant's roots getting severed). Once the soil has been loosened enough, I remove some soil from the pot to make space for the compost. Once done with this, I put the compost in the pot and mix it with the remaining loosened soil so that the soil gets somewhat even texture (the compost is mostly moist and darker in colour than the normal soil). This practice ensures that even if even if your pot or container is filled completely with water and the water overflows, it won't take all the compost with it (compost is very light and does contain small air bubbles, hence floats on water). 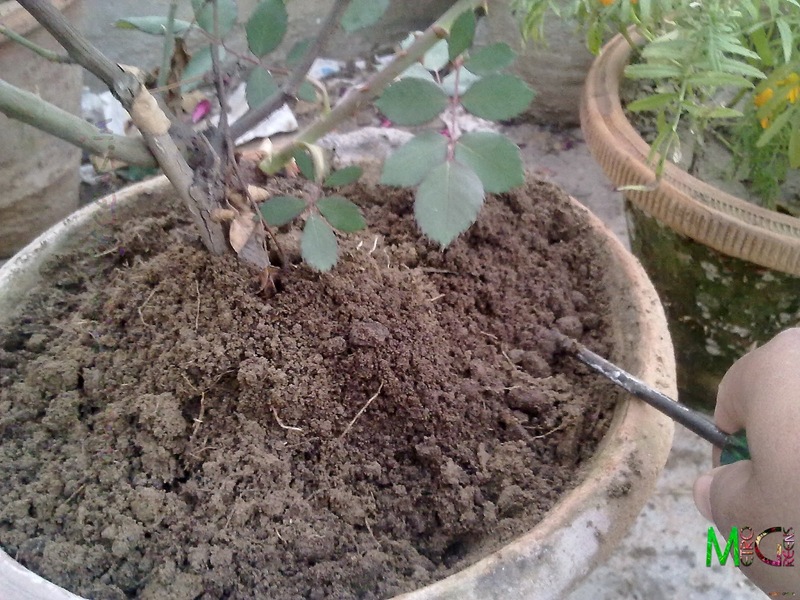 Step-1: Let the potted soil dry to an extent that your plant doesn't feel the water scarcity. Step-2: Using a tool, dig up the soil to loosen it up. Remove excess roots which break come up in the process. 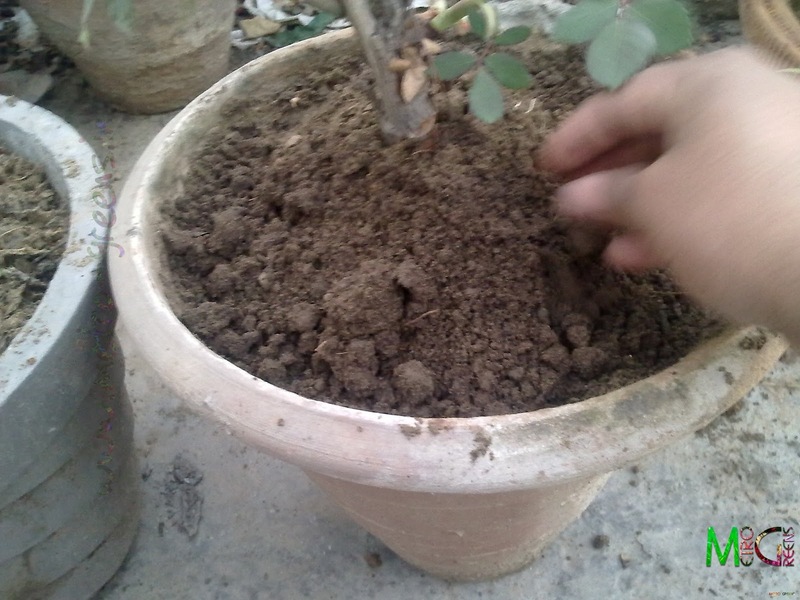 Step-3: Remove some soil from the pot to make space for compost. Put the compost in the pot, and mix it well in the soil using your gardening tool. Step-4: Once the soil and compost are mixed well, you're ready to repeat this process with another plant. Don't forget to remove excess roots that break and come out in process. Since, we are dealing with our beloved plants, we can't afford to be careless. That is why I use a regular screwdriver instead of gardening tools. Using a screwdriver, though takes more time, minimizes the risk of important root systems getting severed or cut. Even a screwdriver is no foolproof a tool for this purpose. You need to be careful with that too. As explained above, since the compost if lighter than water because it does contain small pockets of air, most of it easily floats on water and can flow off with overflowing water, thus it needs to be mixed well with the soil. The frequency to be maintained for application of compost should ideally be every 45-60 days or so. Or a good measure would be to take a small portion of soil and check the soil for chunks of compost. If they are there, you may give it another couple of days or so before applying compost again. I hope that this post would help some of you in the process of feeding your plants. I'll be back with some interesting stuff in the next post. Till then, keep visiting and HAPPY GARDENING! I am growing brahmi plant in pot, the problem is leaves are turning yellow. There might be a number of reasons for the leaves turning yellow. In case you've got that plant recently, maybe, it's transplantation shock that's causing the leaves to turn yellow. If this is the case, try moving the plant to a place where in the plant doesn't get direct and harsh sunlight. If there's cold out there, as I'm expecting winters have taken over almost the entire India, try moving the pot in someplace warmer, maybe, inside your house. A few other causes may be excessive watering, or the use of pot. If you're watering it excessively, stop it immediately, because, that will cause the roots of the plant to rot, and this might cause the leaves to turn yellow and the plant to die. Plants just need enough water to survive, and since in pots, there's no way to spread some else, the water stays in the pot. Do check out the pot too. I believe plants do best in earthen pots, and not so good in cement ones, and even worse in plastic ones. The reason being the aeration. While earthen pots allow excessive water to seep out through the pot's walls, the plastic and the cement ones don't. Another cause can be using waste vegetable peels and such stuff directly in the pot to serve as compost. While it is true that we can use kitchen wastes like tea leaves and vegetable peels in our kitchen gardens, but, this stuff has to pass through a process of composting that takes anything between 60 to 90 days. If we leave the raw vegetable peels in soil, the rotting and composting matter would cause increase in the acidic levels of the soil, thus killing a live plant. A solution may be to carefully remove the plant, from its current pot, along with some soil and all the roots. Arrange for some other pot, mix some compost manure into the soil, and place the plant into this pot. Make sure that you don't entirely cover the hole an the bottom of the pot. If you want, put a small stone that would prevent the soil flowing off with the water. I hope this would help you out and your brahmi plant survives. Thanks for the valuable suggestion, I was putting Kitchen Vegetable peels in the pot. Also, I would like to know one more thing how to use cow dung for potted plants. Hi, As I suggested, that it might be because of the vegetable peels directly used into the plants. Actually, this thing might work with plants on land, as there is a larger amount of soil and micro-organisms which decompose the organic matter, and the decomposing organic matter gets dissipated over a large area and more soil, but, for pots, it won't be quite a good idea, that because we have a limited amount of soil, and the micro-organisms which decompose the organic matter would cause the acidity levels of the soil to increase thus negatively impacting the potted plant, as probably in the case of your brahmi plant. 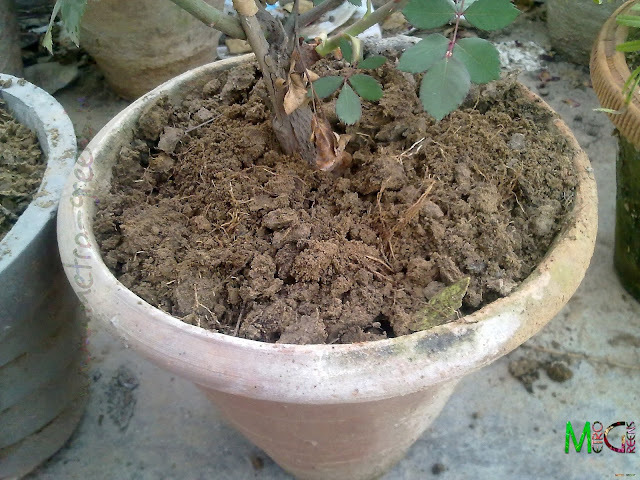 How to use Cow dung for potted plants and how much quantity per pot and in no of days interval. I more thing I would like to ask, I have inquired all my near by nursery they are not having vermi compost instead they have some black colour soil add to regular soil. I have used it earlier but have not got good result. This time instead of soil I want to use Coco peat and I have already brought one 5 Kg block of it. Now which compost I can add to Coco peat? Hi, I'm sorry for the delayed response on this. I'm not sure whether you're in India or somewhere else. If you're in India, and belong to some Hindi speaking area, try asking for "khaad" (खाद) from the nursery people, and I hope they would be able to provide a packet to you. As far as my knowledge of coco peat goes, it works good for germination of seeds, but not that good for plant growth. When using coco peat, once the seedlings are mature enough to be transplanted, they have to be transplanted to soil. As far as using Neem based organic fertiliser is concerned, it too is good to be applied as organic manure. 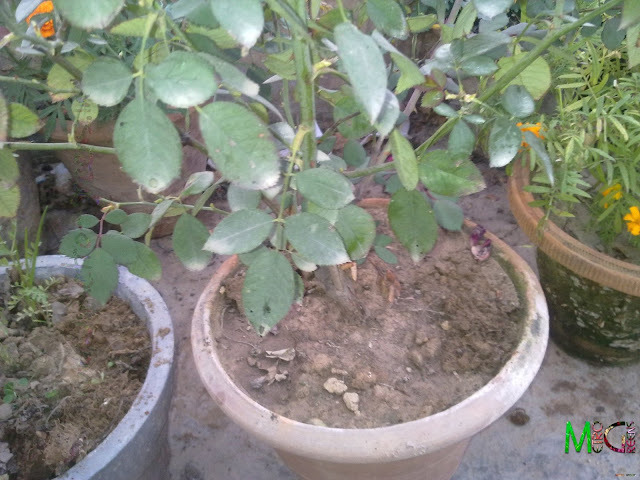 My query is, when we brought pot plants from nursery plants survive nicely for few months say 3 to 4 months after that soil turns harder and harder and finally if we remove the plant from pot and see the bottom and middle the soil has became so hard just like rock. 2) Is their any permanent solutions for this, so that same plant can live in pot for years & years instead of buying new plants and soil every 3 to 4 months. Hi, for maintaining the soil condition, I would suggest you to add compost to maintain the soil in a better condition. Adding compost provides organic content to the soil which doesn't let the soil harden. Most of us think gardening is a very easy task which in reality isn't. You have to work hard in your garden, or pots, for good results, else, your plants would die due to neglect. As I have stated in this post, regularly working up on the soil, digging it every two-three months or so, helps maintain the soil in good condition and helps the plant's roots to grow better, ultimately resulting in a healthy plant. I do not buy the same plants again and again, and I have plants as old as three years now, in the same pots. All you need to do is dig the soil in the pot, as deep as possible, using some gardening tools (I prefer a long screwdriver), atleast within a duration of two months or so, and use some compost or manure in the soil to provide nutrients to the plants.